Board games used to be the bees knees when I was a kid “ yet today there are so many electronic devices that the good old board game is becoming forgotten. Board games are great for families “ they encourage bonding, quality time and prevent kids from getting wound up and anxious like they do in front of computer games and television. Having a board game night at home can really make a difference for families. Have you had one recently? Here are some great board games that your children will love “ remember these mum and dad?! All of these games are available from Fishpond with FREE shipping in Australia, or if you’re in the US, check out Amazon. Time to stock up? The board game Beetle is so simple that even the younger kids can enjoy it “ as well as mum and dad! Roll the dice and get the right parts to build your beetle! Lots of fun and not a long drawn out game that will lose interest “ with cute little beetles who would get distracted?! You haven’t lived if you haven’t played Twister!!! What an awesome game that was when I was a kid. Spin to get a colour and body part that you need to put on the big coloured spots. Great for little kids as well as big kids (when the little kids are in bed, hey mum and dad!) Twister is a must have for families “ indoors or outdoors on a beautiful sunny day “ you can get a good dose of vitamin D at the same time. Twister is also available as Twister Dance “ if you want to make your game a little more rockin’! 48 bugs jumping, shaking and moving all over the place! Can you get all your bed bugs first? A game with quick rounds that will be sure to make the kids giggle. A fun, classic game that doesn’t require batteries! Its a race around the board “ I don’t know whats more fun, the race or popping the bubble! 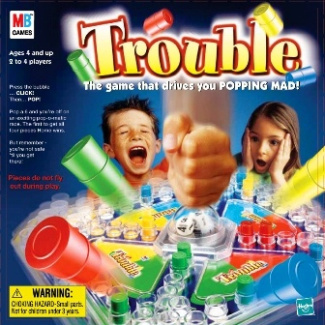 Trouble is a nice quick game all of the family can enjoy. Guess Who is a rite of passage when you’re a kid! How fun is it guessing which person your opponent has! Engages the mind through thinking and imagination. A great one on one game with the kids. Also available is Guess Who Fun On The Run (travel version) and Guess Who “ Star Wars Edition just for dad! A great game where you lose your marbles “ and it’s fun! Carefully choose which stick you’ll pull out next, then carefully, slowly pull it out and hope the marbles don’t fall! The player with the least marbles dropped is the winner. A game of suspense and thinking “ loads of fun! A game similar to this (and mighty cute!) is Tumblin’ Monkeys. Who HASN’T played Hungry Hungry Hippos? 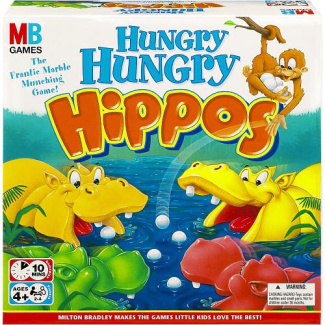 Probably a game better during the day than before bed, as players scurry to gobble up all the balls in Hungry Hungry Hippos. A classic game that your kids will want to play over and over again! Trap mice in the mousetrap, without getting trapped yourself! Collect bits of cheese and build your mousetrap in this fun game! If you’re the last mouse captured, you win. A little bit of competition is great for kids “ helps them blow off some pent up sibling or parent frustration! Great fun, more for the older kids. I remember seeing this game advertised on television when I was about 8 years old and wanted it the minute I saw it! You get to play doctor when you play Operation “ a game that brings imagination and fun to life! Remove ailments from the patient’s body using tweezers, but if you set off the buzzer, look out! Fun that will have your kids in stitches (sorry couldn’t help myself!) for 1 to 6 players. Here are three more classic board games which are better suited to older children. I used to LOVE word games “ Boggle was a favourite of mine! Racing against the clock to make up as many words as you can. A great thinking game for older children. 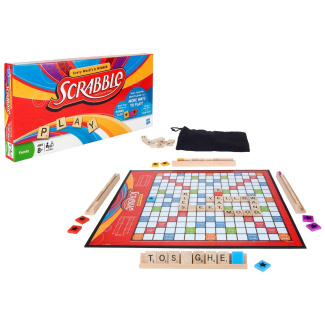 Another great word game that has remained highly popular over the years. Rated at 10-14 years plus, its a brilliant strategy game that helps kids develop their vocabulary and gets them thinking. I couldn’t have a board fames list without Monopoly! Rated for 10-14 years plus, no home should be void of this great game. It comes in a plethora of variants now, from Monopoly World of Warcraft, to Monopoly Family Guy to Monopoly Lord of The Rings! You can get these great games from Fishpond in Australia (free delivery) or Amazon in the US.